Leave the world behind. Come to Sapelo Island. Apartment near the beach. Sleeps 4-6. Check out our SPECIAL WINTER RATES: SNOW BIRDS book now for Dec. 1- March 15 at SPECIAL RATES. Call us and we will work out a plan that suits you. Go for this casual wild place and experience personal renewal .When relieved of 24 hr. stores, malls, traffic, light pollution, noise pollution and just too many people our guests often speak of feeling renewed. 7 miles of beach, many miles available to walk or bike and no crime. Bikes and a vehicle go with the rental. Evening meals available through local caterers. Ready to leave the world behind for a complete get away? The Retreat on Sapelo awaits you. Yours may be the only footprints on the 7 miles of uninhabited beach on the Atlantic Ocean, this barrier island if full of sun, wildlife, birds and outdoor recreational opportunities. INCLUDES USE OF A VEHICLE WHILE YOU ARE ON THE ISLAND (You pay for the gas) AND TWO 26' BEACH CRUISER BICYCLES ARE INCLUDED IN THE PRICE. CALL OR EMAIL NOW! ARTIST, WRITERS, PHOTOGRAPHERS--Need a quiet place away to work. The Retreat on Sapelo is perfect, private, with highspeed wireless I-Net and your own vehicle and bicycles to roam the island at will and let it inspire you. Empty out mainland cares and distractions and let the creativity flow. Get on the passenger ferry, Katie Underwood, for the 20 minute ride to the island. Let the wind and waves wash away your cares and stress and recreate you into the person you are AND RECONNECT WITH YOUR LOVED ONES.. Peaceful, serene and full of wildlife and birdlife, this 44 square-mile island has less than 100 inhabitants and is home to the historic Geechee community of Hog Hammock. island population is less than 100 people. Your base camp will be the The Retreat, an upstairs apartment with its own private deck, a great place for morning coffee and breakfast, unwinding after your day out on the island or stargazing at night. You will have a separate bedroom with a queen size bed, in addition there bunk beds for two built into a niche outside the bedroom, a sitting area with futon (can sleep 2 more), a full bathroom, full kitchen and pine dining nook. Two bicycles are furnished with the rental and guests are furnished transportation during their stay. Generally, it is a good idea to bring at least some food with you, You may have some or all of your meals catered to My Sapelo Retreat and If you're lucky to be here when she's cooking you may get to eat at Lula's Kitchen where local food is served in abundance and in the Gullah/Geechee style. Keywords: Cottage like retreat; beach, solitude, serenity, non-consumeristic, geechee, research, artist, writers, photographers, rest, relaxation, fish, hunt, peaceful, serenity, renewal,restoration. HI! 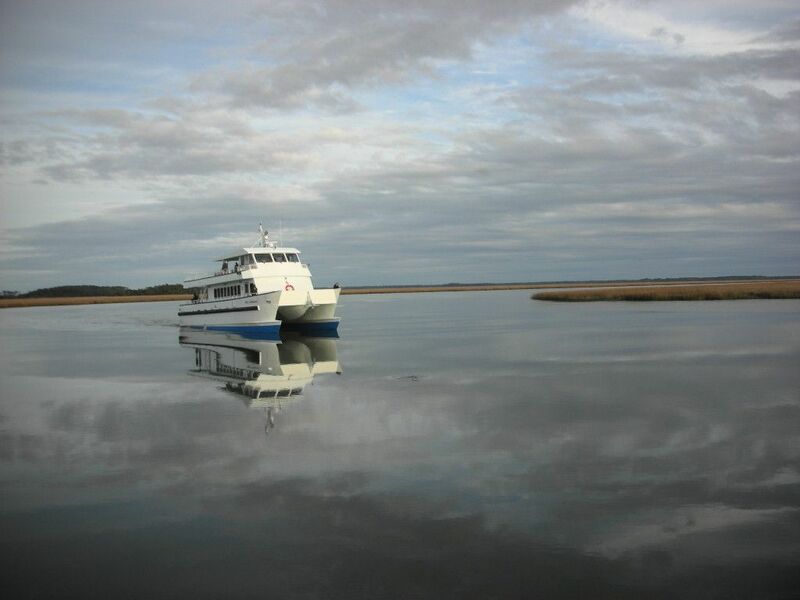 I AM LUCY AND MY HUSBAND, MIKE, AND I OPERATE OUR VACATION RENTAL APARTMENT ON SAPELO. IN OUR OTHER LIVES MIKE IS A CONTRACTOR AND I AM A REALTOR WITH COASTAL PROPERTIES OF GEORGIA (912 437-2444. WE'VE BEEN LIVING ON SAPELO FOR 25-30 YEARS DEPENDING ON WHICH OF US YOU ARE TALKING TO. WE LOVE IT. SAPELO CAN PROVIDE TOTAL AND COMPLETE DOWNTIME-SOMETHING HARD TO GET IN TODAY'S WORLD. YOU FORGET HOW MANY STARS THERE ARE. NO TRAFFIC. NO LIGHT POLUTION. NO TEMPTATIONS TO STALK THE MALLS. WALK OUR BEACHES AND LET THE SUN, WIND, AND WATER WASH AWAY YORr CARES, FATIGUE AND FRUSTRATION. It is an attractive, cozy spot that guests seem to love and return to. Has all the modern conveniences including wifi . Experience the "Aaahhhh" of stress relief from the mainland world's hectic pace. Guests use peaceful, tranquil and soul filling to describe their visits here. Their words, "There is nothing like it." " I went from a human doing to becoming a human being again." Sapelo Island is protected; there are no buildings on the beaches or dunes. All rentals are in the Hog Hammock community making them 3-4 miles by road because of how the roads run so comes w/vehicle. As is all private dwellings, My Sapelo Retreat is located in the rural community of Hog Hammock on a dirt road. No development is allowed on or near the beaches to protect our pristine environment. Guest vehicles are parked on the mainland in the dock area. Parking is free and provided by Dept. of Natural Resources. Refer to pictures to see the pine dining nook. It can seat 6 but is most comfortable with 4 guests. 4 beach cruiser bikes are provided. As a super busy mom of 3 it was the perfect spring break, no hustle and bustle, no fuss, no traffic, no neon! The beach was absolutely beautiful, and the apartment was quaint. It took some planning to make sure we had enough food for the first couple of days, but had no problems what so ever catching the morning ferry and returning that afternoon. My girls had a blast driving around the island looking at the scenery. Our adventures produced wild hog, a rattlesnake, an armadillo, alligator, and a horse sightings. The trees with the Spanish moss hanging down that lined roads were so hauntingly beautiful. All in all, a great vacation, no doubt we will be back. A treasure of a place! We had the most amazing time with Lucy and Mike on Sapelo! They were such amazing hosts, great company, gave us a superb tour, and the apartment was perfect. I will definitely be coming back to stay with them! thanks you Lucy for your hospitality. My get away was a great success. It was made to order for me. Very restful and peaceful. Will certainly return in the near future. We Left The World Behind...Literally! Wonderful spot, superb accommodations and extremely knowledgeable and gracious hostess and host. Could not have asked for more!!! Three of us (two girlfriends and I) spent a few days on Sapelo at Mike and Lucy's. Their apartment was perfect for us! It is charming with just what you need to be comfortable and is located in the little community of Hog Hammock and not far from the beach. The car and bicycles gave us lots of options for roaming in addition to our feet. Both Mike and Lucy are easy-going, sociable, available, and very knowledgeable about the island, which ensures that your stay will be as magical as ours. They will make extra effort to ensure you have a good time! We highly recommend their place if you are planning a trip to Sapelo and we look forward to staying with them again! My Sapelo Retreat is on Sapelo Island which is 4 1/2 mi. from the mainland. On the Island there is only 1 small convenience store and a post office. Several of the things I have commented on are in the historic fishing village of Darien, a frequent overnight before the trip over to Sapelo. The restaurants I've commented on are in Darien and there is a fine gourmet wine and cheese store and wine bar there, Waterfront Wine and Gourmet on the waterfront on Broad Street. Some types of activities require hiring a guide, deep sea fishing, kayaking, scuba diving but I can connect you with the folks who do those things. Just ask! I'll be glad to answer your questions. $850.00 per week for 4 or more guests.